Superdry Oxford is an exciting new family. 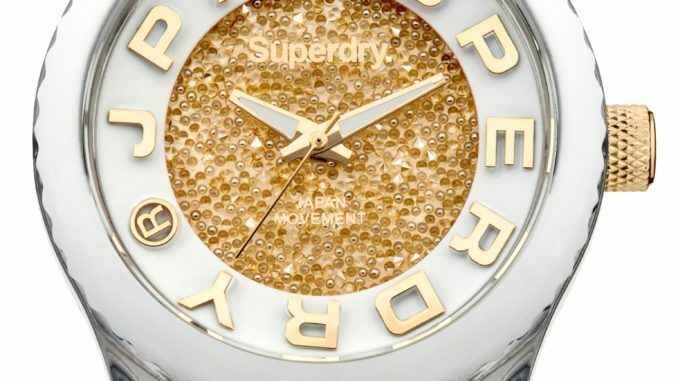 An eye-catching three colour design with the iconic Superdry script vintage logo sitting prominently against the white dial. The Oxford is a traditional edge to the current fashionable watch collection, featuring bold silver hour markers with matching silver hands for effortless time keeping. Teamed with a sleek navy and red nylon stripe strap and tan leather tips, this is an ideal accessory for any smart casual day wear. Also available in navy and grey or black and grey stripe straps. Tokyo Simmer is stylish, trendy and cool with a hint of dazzling femininity. The new Tokyo Shimmer is an attractive time piece bursting with original Tokyo DNA. The Swarovski crystal fabric dial combined with the IP rose gold lettering and crown, adds chic and sophistication. Like all Tokyo’s, it has a soft chunky blue silicone strap, an iconic display of brand and symbols, and a fusion of modern materials. The collection is also available in black or white silicone strap. A trendy sport styled multi-function watch with distinctive Tokyo qualities. The Tokyo Multi is an exciting new model for the gents this season. The three colour design is styled mainly in black with pop orange and white, highlighting certain elements of the watch. The sub dial displays crucial day, date and seconds for precise time keeping, finished with a transparent smoky plastic case. The collection is also available in dark blue silicone strap.